Whimsical modernist Albert C. Ledner – who studied under Frank Lloyd Wright – designed a suite of unquestionably idiosyncratic and wholly unique buildings for the National Maritime Union in the 1960s to grace the Manhattan’s increasingly conservative skyline. 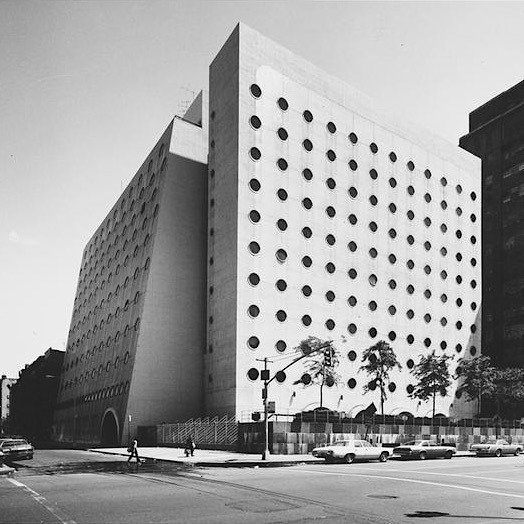 Ledner’s building on West 17th street blended bleached, monolithic Modernist cues with nautical notes to arrive at a form dotted with porthole windows and accommodating a facade that leant backwards from the ground plane. Once containing office spaces, a large auditorium and dormitories for seamen, the building has since been converted into a boutique hotel, with unsavoury renovations largely reversed in recent years.